Sunday Divine Service: 9 a.m.
Sunday School & Adult Class: 10:30 a.m.
Thursday Internet Study Group: 7 p.m.
Our mission is faithfully to preach the Word of God, both Law and Gospel, in accordance with the Holy Scriptures and the Confessions of the Evangelical Lutheran Church; correctly to administer the Holy Sacraments for the forgiveness of sins; and to reach out to those who have not yet come to faith in Christ Jesus. Worship with us at Redeemer Lutheran Church! The members and friends of Redeemer Lutheran Church would like to introduce you to the faith and fellowship of our congregation. We are a gathering of Christians in the tradition of the Lutheran Reformation who come from a variety of backgrounds, but who share the conviction that the most important thing in this life is to know and experience the love and peace that only God can give. should not perish but have eternal life. In the Gospel of Jesus Christ, the divine-human Savior of the world, we have found this love and peace  or rather, this love and peace have found us! Humanitys most basic problem is its sinful alienation from God. In Christ, who died and rose again for us, God himself solves this most basic problem, and graciously restores humanitys broken relationship with its Creator. 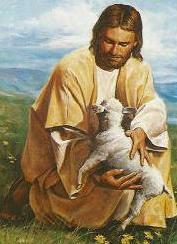 Through his Word and Sacraments, Jesus assures us of the reconciliation with God that he has accomplished for us; he forgives us all our sins; he comforts us with the promise of his sustaining presence with his people; and he preserves and strengthens within us the faith by which we receive and enjoy all these blessings. This is the faith that gives meaning and purpose to our lives, and this is the faith that we would very much like to share with you! If you would like to know more about the beliefs and activities of our congregation, please visit the other pages in our web site, or contact our Pastor. He would be very happy to talk with you, and to be of assistance to you in whatever way he can. The Pastor also conducts special classes as needed for those who are considering the possibility of membership at Redeemer, or who would simply like to study the basic teachings of the Lutheran Church. Redeemer Lutheran Church is affiliated with the Evangelical Lutheran Synod, an orthodox Lutheran church body based in Mankato, Minnesota. The ELS has congregations in 17 states, and conducts or sponsors mission work on several continents. It operates Bethany Lutheran College and Bethany Lutheran Theological Seminary, both located in Mankato. The ELS is a member church of the Confessional Evangelical Lutheran Conference, and is in fellowship with the Wisconsin Evangelical Lutheran Synod. Redeemer Lutheran Church is located on East Jomax Road in North Scottsdale, ½ mile east of the intersection of East Jomax Road and North Scottsdale Road, and 1 ½ miles west of the intersection of East Jomax Road and North Pima Road. 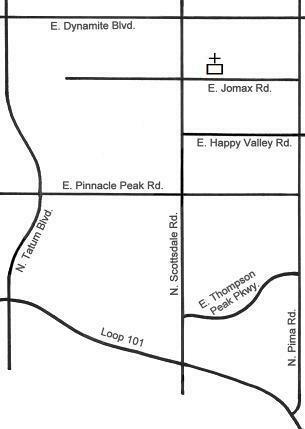 From Loop 101, take either the Scottsdale Road exit (Exit 34) or the Pima Road exit (Exit 36), and proceed north. Scripture passages are from the English Standard Version, copyright 2001 by Crossway Bibles. We are affiliated with the Evangelical Lutheran Synod. We are not affiliated with the Evangelical Lutheran Church in America, which has a similar name, but which holds to very dissimilar teachings on many important matters of doctrine and morality. We still believe what the Bible says about the pain and destructiveness of human sin. We also still believe what the Bible says about God’s love and forgiveness in Christ, and about the power of his Gospel to heal the hurting and restore the lost. Those who worship at Redeemer Lutheran Church believe that this is a special congregation. Many of them are willing to drive a significant distance in order to be a part of this family of faith. Our members and regular seasonal visitors live in Scottsdale, Phoenix, Cave Creek, Anthem, Rio Verde, Fountain Hills, Peoria, Sun City, Ahwatukee, Tempe, Mesa, Queen Creek, Apache Junction, Gold Canyon, and even beyond. And so, wherever you happen to live in the Valley of the Sun, consider letting Redeemer Lutheran Church be your Sunday morning destination. You may find that some of your friends and neighbors are already here! 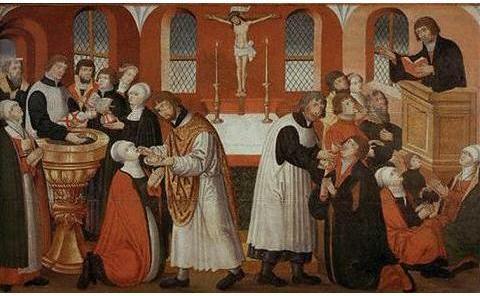 Lutheranism the way it used to be. Lutheranism the way it can be once again.